Since I haven't read a well written mermaid based novel in a while, I was super psyched when I got accepted by Netgalley to review Tempest Revealed, the last installment in Tracy Deeb's exhilarating Tempest Series. There has been no shortage of mermaid/siren novels released in the past year, but only a few of them caught my attention, Tempest Rising obviously being one of them. As soon as I flipped to the first page, I knew it was going to be a keeper and eagerly waited for the rest of the series to release. Now we've finally reached the last novel, and although it's sad to see this incredible series come to an end, it's also exciting to see the protagonist triumph over evil and finally obtain her well deserved happily ever after. Tempest Maguire can be described in a countless number of ways, but if you asked me to do it in four or less words, I would say Reckless, Stubborn, and Possibly Insane. There were plenty of times when I admired the lengths she took in order to ensure her loved ones' safety, but there were also moments when I felt that she acted too recklessly. She did think things through calmly and rationally on occasion, but the majority was spent literally swimming head-first into bad situations, giving no thought to the consequences that might follow after. Since she was half mermaid/half human and had strong connections to both land and ocean, I understood why her loyalties were divided and why she was so desperate to stay a mermaid but still maintain a firm grasp on the humanity that was slowly slipping away. However, even though she stated several times throughout the novel that she cared about what happened to the Merpeoples in her domain, I never once saw that train of thought translated into action. Although I did have many issues with Tempest's character that I did not have in prior novels, Tempest did still keep many of her more commendable attributes. I loved the fact that she never backed down and continued fighting desperately with all that she was, even when the odds were stacked against her. I didn't exactly hate the romance, but I was no where close to enjoying it either. If you've been keeping up with this series, you should already know that there are two love interests. Kona, the current Selkie King who was recently dumped by Tempest when she returned to land, and Mark, the first man to ever claim her heart and the man who is undeniably human. I've been a die-hard Team Kona fan during the whole series....up to this point. Jealousy is, of course, expected, but his possessiveness and clear disregard of Tempest's feelings, especially when they had merit, annoyed the hell out of me. He changed so much that I hardly even recognized him anymore. I've never vehemently hated Mark, but I never really cared for him as a love interest either. Now that I think of it, Kona and Mark sort of flip flopped in personalities. In Tempest Revealed, it seemed like Mark was the one who did the sweet, sentimental things instead of being his usual pee-on-what's-mine, jealous, jerkish self. Tempest Revealed was fast paced and filled to the brim with heart-pounding action, yet I felt like the ending was rushed waaaay too fast. Once you get to the last installment of a series, you expect the author to create a huge finale scene and go out with a loud and glorious bang. To have all the questions you asked yourself from previous books answered thoroughly. That was definitely not the case here. I mean, it's been more than a week since I've finished reading this book, and I'm still left reeling from that abrupt ending. The author spent all of her time building the plot, increasing the tension, slowly but surely chugging towards the climax, and when we do finally reach it, nothing happens. I expected the final battle between Tempest and Tiamat to be this huge, electricity-flinging, water-slamming, whirlpool-creating thing of epic proportions, but it only lasted a measly five or six pages. I felt cheated. In conclusion, Tempest Revealed still kept it's trademark action scenes, but ended up disappointing me in so many ways. I didn't enjoy the romance, because most of it was Kona and Mark possessively yanking Tempest back and forth in some sick game of tug of war. The action was well paced and had me clinging to my seat, up until the end at least, where things went downhill fast. Although Tempest Revealed fell short of my high expectations, I still had a great time reading it, despite its many flaws. Loved it until the very end. 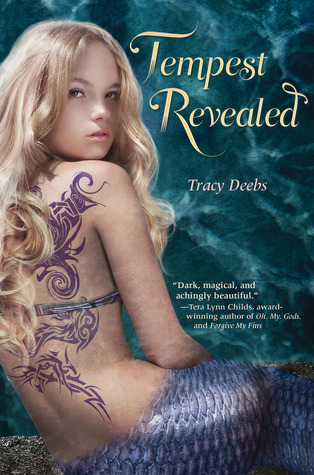 I haven't been lately up to mermaid books but this series sounds fairly promising! The synopsis sounded so good but I think that I wouldn't like it because of the romance. I totally understand how you feel and I would prefer a better romance as well. Maybe I'll read it once day. I'm also your newest follower! I would really appreciate it if you could come over to my blog to check it out and if you like it, you can follow me as well. I blog about my favourite music and books hence the name Music Plus Books. I've been meaning to read a mermaid-y book and even though this looks good, I think the romance would annoy me. I like a really good romance element, even if it's small.